There are lots of ways I plan and generate ideas when I’m building the world of a story. When I’m working on a novel, I get a notebook where I can jot down everything from outlines and timelines to characters sketches and scene ideas. I’ve heard of many writers who doodle and draw in their creative process. While I like visual inspiration, I am no artist, so my brainstorming usually takes written form – journal entries, letters and scribbled questions. One thing I do like to see a visual of is a layout of my character’s home. When I am building the world of my characters, it often starts with the place where they live. Do they live in a studio apartment, a townhouse, a mansion? How many rooms does it have? Is it spacious or cramped? How is it decorated? In the days when Internet was dial-up, I used to look through home and garden magazines and department store catalogs to find images that seemed to reflect my characters’ tastes in bedding, curtains, furniture and gardens. I would clip them and save them in folders that I could revisit when I needed help describing something or setting the scene. 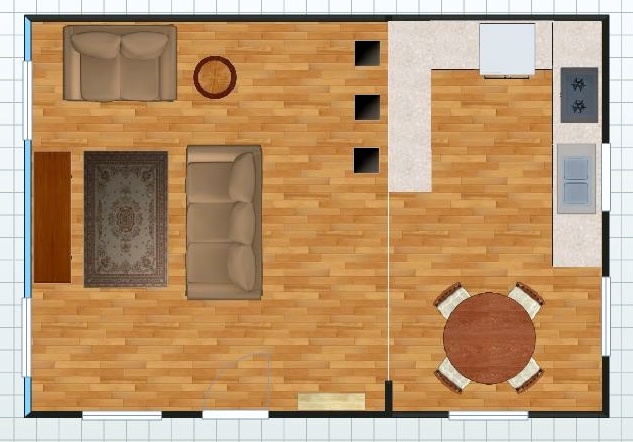 I found websites that let you design floor plans for free which can be a ton of fun but mostly, I don’t have the patience for all that. All I need is a rough sketch to help me visualize things. Sketching a floor plan usually comes somewhere in the middle of the creative process for me. I’ll have a vague image of the space in my mind as I’m writing, but eventually I get to a point where I like to see how everything is connected. Once I draw out the floor plan, it helps me to understand where my characters (physically) are as they move through the rooms. After I have a solid grasp around the layout of the rooms, I can focus on the details like the arrangement of the furniture and the location of windows and doors. Then I turn to visuals like Pinterest to think about the decor and how it reflects the character’s personality and tastes. Slowly, it all starts to come together. I no longer have characters walking around in white-washed rooms, they have a leather couch to collapse on to and a copper tea kettle on the gas stove to make a warm beverage. Writers, do you create floor plans when you’re world-building? Do you sketch or draw as part of your creative process? What sort of visuals do you use to inspire your stories? This entry was tagged Inspiration, The Creative Process, The Writing Process, Writers, Writing, Writing tips. Bookmark the permalink. I end up drawing hideous, scribbled diagrams of a character’s house or a major setting — nothing is to scale, but it helps me and gives me an idea of where everything is in relation to everything else. Having something written or drawn out helps with consistency, too. I look back at my diagram to make sure the bed doesn’t appear on the right side of the room in one chapter and in the left side in another chapter. I tend to use real life places because I can draw from the scents, sounds and visuals that already exist in my memory. I love the way you consider a character’s home, I think I’ve always thought of the home separate from the character (a character in its own right) for some bizarre reason! I, too, pull from places I have been in real life. I notice this when I’m reading. When I’m reading a story and imagining a character’s home I always imagine it to look and feel like the house of a family member or friend, even when it’s a house I haven’t been to since I was a child! It’s amazing the details I can remember about a place though much time has passed. Floor plans! Nice! I’ve never made a floor plan for one of my books, but I do collect images for them. Sometimes consciously, like with Pinterest, and sometimes unconsciously. For my next book I saved an ad that captured the Tim Burton-y/Coraline/dark magic quality I was going for. That was months ago. Recently I rediscovered the ad, which features twins in witchy fashion, and guess what?– my outline for the book had come to include witch twins!